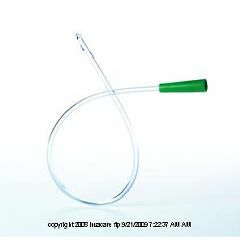 This intermittent catheter has a hydrophilic coating that activates immediately upon exposure to water - for fast, clean, lubrication and maximum ease of use. The Self-Cath® Plus has a unique, uncoated, GripZone™ area for total control in handling. Flexible, medical grade PVC with smooth, fire polished eyes. Available in several sizes and styles. Single use, latex-free.